Pining for Pilgrim’s Famous Losh Kebab Meal? Wait no longer! Pilgrim’s Merchant lunch, dinner and country store is May 5. Treat yourself, office mates, neighbors or a passerby to a delicious meal of losh kebab with all the fixings! 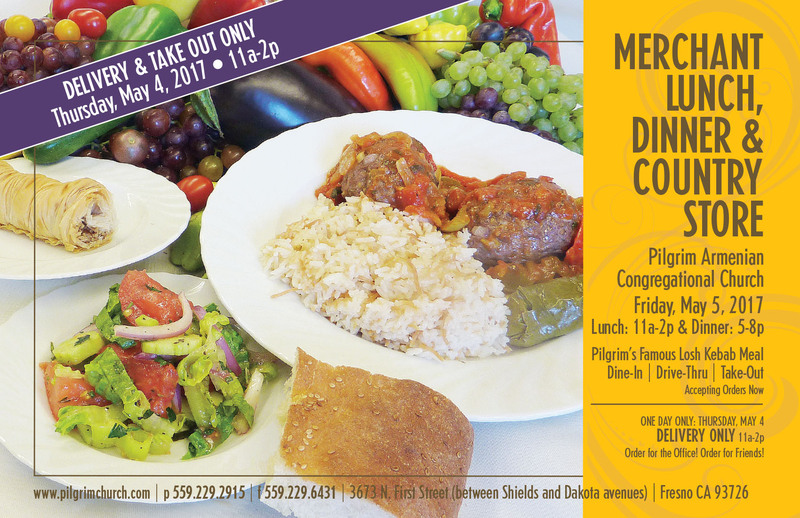 For $15, the meal includes two losh kebabs with sauce, Pilgrim’s pilaf, Armenian salad, fresh peda bread, yalanchi and Armenian bourma. Skipping breakfast is recommended. You can dine in or take advantage of the drive-thru and take-out options. Lunch will be served 11 am – 2 pm, dinner from 5:00-8:00 pm. For one day only, Thursday, May 4, you can have delivery from 11 am – 2 pm. To order you can either call the office at 559.229.2915 or fax the downloadable order form HERE to 559.229.6431. For delivery, please download delivery order form HERE.